Hello and welcome to my blog, Author Interviews. My name is Fiona Mcvie. Let’s get you introduced to everyone, shall we? Tell us your name. Hi Fiona, thanks very much for having me here, it’s lovely to join you today. Fiona: Where are you from? I’m English, and I’ve lived most of my life in south east London, though I spent nearly ten years in Brussels. Fiona: A little about your self (ie, your education, family life, etc.). I went to St Andrews University, where I studied Modern History, and then worked as a journalist on many UK newspapers including The Daily Express, The Times, and The Daily Telegraph. I’ve been married twice and have two children and two stepchildren – and two cats. The cats are the most difficult, of course. Fiona: Tell us your latest news. I’m doing a talk on my books and the writing process at 6pm on 1st March for World Book Day, at Greenwich Centre Library in Greenwich, London, SE10 9HB. I’ll be signing copies of my books afterwards. I’ll also be signing and selling books at the Dulwich Open House Festival in May. Fiona: When and why did you begin writing? I began writing seriously when I was about 11, but I’ve been making up stories for far longer than that. Fiona: When did you first consider yourself a writer? My first book, Hot Chocolate, a chicklit novel based partly in Brussels, was published in 2010 and that’s when I finally considered myself a writer, even though I’d been supporting myself by writing for years at that point. Fiona: What inspired you to write your first book? I’d always wanted to write a full-length novel and I hoped that expat life was unusual enough to interest other people. I also had the opportunity as my children were very small and I couldn’t do much work out of the home. Fiona: How did you come up with the title? The first title I came up with for that book was Expatriot Games, a play on the title of a very popular film of the time, Patriot Games, but my agent and then the publisher weren’t keen and I eventually came up with Hot Chocolate. Fiona: Do you have a specific writing style? Is there anything about your style or genre that you find particularly challenging? 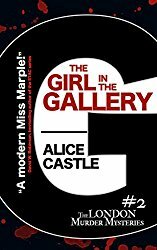 I’m currently writing the London Murder Mystery Series, a cozy crime series starting with Death in Dulwich and The Girl in the Gallery. It’s quite a specific genre but luckily I really enjoy writing in quite a bouncy style which is a counterpoint to the sometimes dark subject matter. Fiona: How much of the book is realistic and are experiences based on someone you know, or events in your own life? I lived in Dulwich for four years and know it quite well, so the details about places are accurate. Some landmarks and institutions I have fictionalised and the characters are all entirely fictional. As I write about murders, they are made up too – which can be a stretch as I like to think I am a gentle person. Fiona: To craft your works, do you have to travel? Before or during the process? 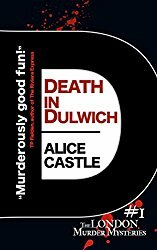 I go to Dulwich very frequently as I have friends there, and I also research other areas of south east London that are mentioned in the books. I don’t live too far away and it’s never a sacrifice to go and have a cup of coffee in a Dulwich café! Fiona: Who designed the covers? My publisher, Crooked Cat, came up with the brilliant cover designs. Fiona: Is there a message in your novel that you want readers to grasp? One of the functions of crime fiction is to remind us that there are concrete notions of good and evil in the world. At the beginning of a crime novel, that balance is disturbed and by the ending it should be restored again. I think that is why they are satisfying novels to read. Fiona: Are there any new authors that have grasped your interest? Who is your favorite writer, and what is it about their work that really strikes you? There are loads of writers I really enjoy, from the great Agatha Christie all the way through to Val McDermid. I’m currently reading a historical whodunit by Imogen Robertson which I’m really enjoying. I’m always thrilled when I hear of a new crime writer on the scene. I’ve loved Mackintosh’s I See You for instance. Fiona: Outside of family members, name one entity that supported your commitment to become a published author. I’m lucky that I’ve got lots of supportive friends who’ve cheered me on. Getting a publisher can be a tricky and long-winded business so you need to develop a thick skin and collect lots of friends with sturdy shoulders you can cry on! Fiona: Do you see writing as a career? Yes, writing has been my career for many years. Fiona: If you had to do it all over again, would you change anything in your latest book? I would absolutely hate to go over my latest book again, I’m sure I would want to tweak a lot of it, but I wouldn’t change the denouement, I was happy with that. Fiona: Did you learn anything during the writing of your recent book? I always try and expand my knowledge while I’m writing. I’m learning more about police procedure all the time, and I have a lot more knowledge of murder weapons and poisons than is good for me! Fiona: If your book was made into a film, who would you like to play the lead? Oh gosh, I would be so thrilled if this happened. Emma Watson would be a perfect fit for my heroine, Beth Haldane. She is conscientious, hardworking but distractable, brave and just a tiny bit reckless. Fiona: Any advice for other writers? Keep on going, accept that it can be a struggle, try not to get downhearted. Fiona: Anything specific you want to tell your readers? I love my readers. They write such wonderfully encouraging things. If I ever have a moment when I’m sitting at my screen and the words aren’t coming, I think of the kind reviewers who’ve said they’re looking forward to the next book. That is exactly what a writer needs to hear. The thought that there are people out there eagerly awaiting Beth’s next adventure is really inspiring. Fiona: What book are you reading now? Imogen Robertson’s Theft of Life, and then I’ve got to read Eleanor Oliphant is Completely Fine. Fiona: Do you remember the first book you read? I absolutely loved Beatrix Potter. We had several but I was particularly fond of The Tale of Tom Kitten, it even has a little bit of a potential murder mystery in it! Fiona: What makes you laugh/cry? My children and my cats make me laugh. My children would also say that I spend a lot of time laughing at my own jokes. Fiona: Is there one person, past or present, you would love to meet? Why? I’d love to meet Agatha Christie; she must have had the most fascinating mind. Fiona: Do you have any hobbies? I love crochet and I’m quite arty, I paint and draw. Fiona: What TV shows/films do you enjoy watching? I love any murder mysteries – of course. With films, I love a Jane Austen, but I’m happy with a rom com or a thriller, as long as it’s nothing too spooky or violent. I’ve just seen Three Billboards Outside Ebbing, Missouri, which was brilliant. Fiona: Favorite foods, colors, music? I love chips and chocolate. My favourite colour is teal and I enjoy Bach. I used to listen to a lot of music but I’m going through a bit of a quiet time at the moment. Fiona: Imagine a future where you no longer write. What would you do? Crochet? Draw? But I’d get grumpy without writing, I’d soon be making letters out of the crochet. Fiona: What do you want written on your head stone? ‘Much loved’ would be nice! 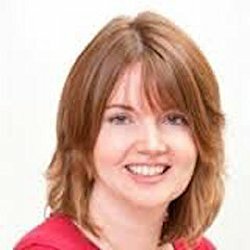 Fiona: Do you have a blog or website readers can visit for updates, events and special offers? Best of luck with your book signing event, it sounds like a wonderful opportunity.